Windows: (2) 4’ x 3’ standard vinyl windows. Stalls: (2) 12’ x 12’ PermaStalls®. Second story floor: 930 square feet. Staircase: 3’ heavy duty staircase. Accessories: 18” eave and gable overhangs. We build to our customers’ needs. And with our Marysville Washington customer, he wanted a multi-faceted barn that functioned in many capacities. 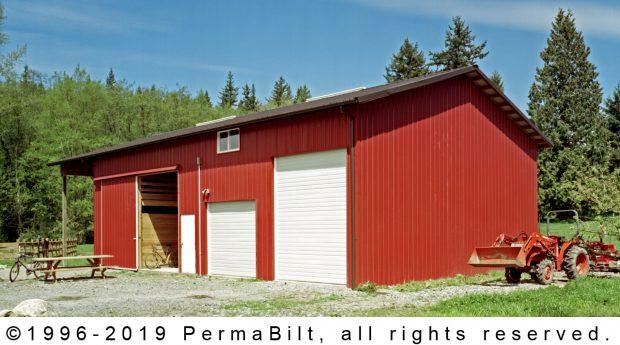 For example, he needed room for his farm equipment storage and horses. Much time was spent with the customer and the Building Representative hammering out the design to make sure it gave the customer exactly what he needed. Once the design was finalized, we obtained engineering and submitted for a building permit. This customer had just recently done an extensive remodel on their home which entailed a review from Snohomish County Health Department. This expedited the Health Department review and reduced costs on the permit for the building. This building was a dual purpose building. Two 12’ bays were used for vehicle storage. The remaining bays contained the PermaStalls® as well as the second floor and staircase. This building had a lot of bang for the buck utilizing every square foot!. Upon completion our customer had a fully functioning 2 story pole barn and shop ready to store his farm equipment and bring his horses home.